His philosophy: my culinary art is steeped in my love for the elements of nature. I let myself be inspired by their incredible variety, enriching the Mediterranean style with the ingredients of classic cuisine. For me it is important to stress a seasonal cuisine, suited to the time of year, and to combine it with the essential products of the region, the spices and flavours of the Alpine world. 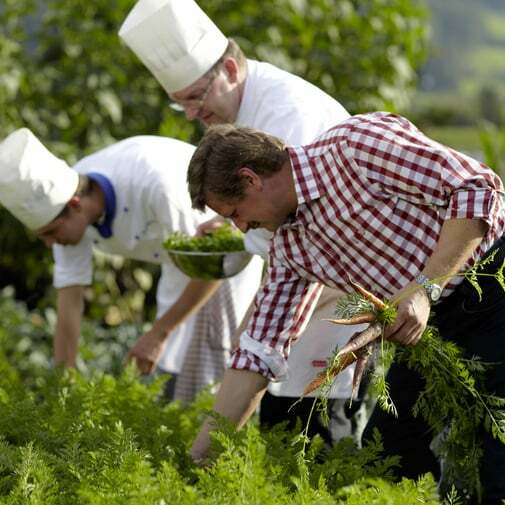 So my passion gives pride of place to Alpine herbs and forgotten roots, that give dishes a refined note while at the same time enhancing their digestibility. Interior equilibrium and wellbeing depend to a large extent on a healthy diet. Product quality and fresh preparation are together an essential ingredient.